This painting by Queensland artist Godfrey Rivers is one of my favourites. It has been called 'quintessentially Brisbane' but it's also 'quintessentially Edwardian'. 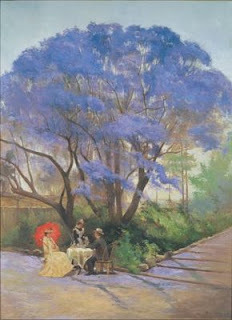 The serene drinking of tea under the shade of the huge jacaranda, the long white dress and the parasol, and the maid serving the tea are all typical of an Edwardian summer. Rivers captured the Queensland light and the bluish-purple shade of the flowers perfectly.